Article submitted by Dana Smith, Challenge Leader of Blessed Sacrament. Each grade level worked on specific service projects in the first semester of the year. The teams reached out to their community and families, truly making a beautiful impact on the world around them. The 8th grade team worked with the Madonna House, which is located in Ft. Mitchell, KY and their mission is to help single young women who have chosen to give birth and raise their child. The goal of the Madonna House is to prepare the mother emotionally, financially, spiritually, and educationally for living on her own and caring for her new baby. 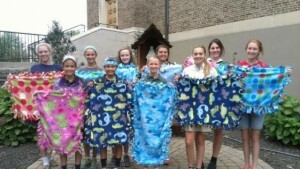 The 8th grade Challenge girls were busy making baby blankets and collecting money to purchase diapers to donate to the Madonna House. 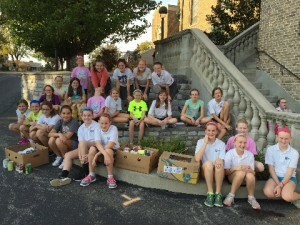 On Friday, October 9th, the 8th grade girls walked up to Madonna House to leave them their care packages. 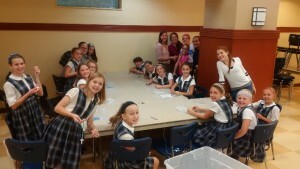 The 7th grade Challenge girls worked on their Pay it Forward Project. The 7th graders brought in money that they earned through completing chores at home to be used in this project. The girls walked up to Biggby Coffee and gave the workers there the money in order to pay for other customers’ purchases. All we asked from Biggby was to let the customer know that it was a pay it forward random act of kindness. The girls were able to watch as customers were surprised by the kindness and some even decided to donate their own money to keep the random act of kindness going. As the girls watched their project unfold, they also were able to write inspirational messages on the coffee sleeves to hopefully brighten someone’s day. The 6th grade team worked hard to collect canned goods to donate to Be Concerned, one of the largest free food pantries in Northern Kentucky since 1987. 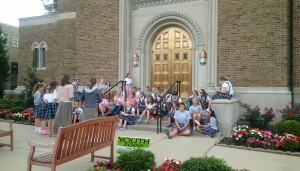 The girls visited and delivered their canned goods to Be Concerned at on Nov 13th. The collections and delivery helped them to understand hunger and helping those in need in their backyard. Since October is the month of the Most Holy Rosary, the 5th graders made rosaries with two of our favorite Consecrated Women while learning about the history of the Holy Rosary. The Holy Rosary was given to the Church by St. Dominic in 1214, who had received it from the Blessed Virgin when she appeared to St. Dominic. As this form of devotion became popular, people started coming up with ways to keep track of the prayers. At first, 150 little pebbles were placed inside small leather pouches to keep count. Next, a thin rope having 50 knots on it was used and eventually, small wood pieces were added to string. As a devotion to Mary, our Challenge girls gathered in front of Church and we prayed the Holy Rosary together.The 5th graders also completed their first apostolic project as they were able to go visit at Notre Dame Academy and perform various acts of service.